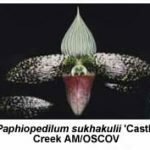 I doubt that Mr Prasong Sukhakul, manager of the Bangkrabue Nursery in Bangkok, could have foreseen the impact that his consignments of P. callosum plants to Northern Europe in 1964 would have on our orchid hobby. 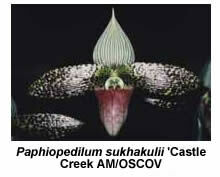 For among the many plants sent, at least two were found to differ markedly from P. callosum (and all other known paphiopedilum species). They were destined to take the orchid world b y storm! 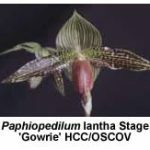 The story of the introduction of this new paphiopedilum species is just as intriguing as many of the earliest paphiopedilum discoveries, because it involved a search for a new paphiopedilum species in Northern Europe, of all places! In 1964 two orchid enthusiasts from Soligen in West Germany were examining some newly arrived P. callosum plants at a local plant nursery. They noticed a plant with different leaf markings from the typical P. callosum and purchased it. 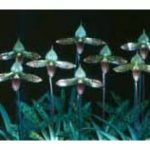 Upon flowering the plant they realised it was probably a new species, sparking a painstaking search for others among the rest of the consignment. Eventually they found a second plant in a Belgian florist’s shop. Two German botanists, Drs. Schoser and Senghas, were called on to examine the new plants. 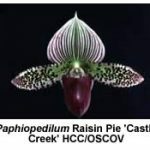 They concluded that these plants were sufficiently different from currently known species, such as P. wardii, P. callosum and P. barbatum, to warrant the granting of separate species status. 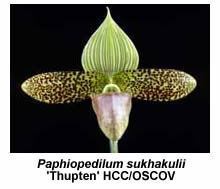 The new species, P. sukhakulii, was described in 1965 and named in honour of Mr Sukhakul. P. sukhakulii is found in the Province of Loei in north-east Thailand, the initial discoveries being in the foothills of Mt. Phu Luang at altitudes up to 1000 m. At lower elevations it grows in the same areas as P. callosum, hence the accidental inclusion of some P. sukhakulii plants in the P. callosum consignments. The natural habitat of P. sukhakulii is reported to be the upper riverine slopes in hilly country, growing in pockets of sandy, humus-rich loam and shaded by tall forest trees. The climate of this area in northeast Thailand is subject to a wet summer monsoon and a drier, cooler winter period with temperatures falling to 6-7 ° C at times. These details provide useful pointers to its successful cultivation, indicating the need for a free-draining mix, intermediate temperatures, reduced watering in winter and extra shading during the summer months. P. sukhakulii is a showy species displaying attractive mottled leaves of light and dark green and a single flower on a tall scape. It flowers from late autumn to mid-spring in Melbourne and frequently has more than one flower scape due to its multi-growth habit. 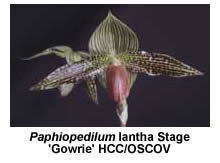 The impressive flower has wide, flat petals held horizontally, these being heavily spotted or speckled purplish-brown. The upright dorsal sepal, with its creamy white background and green stripes, is balanced by a large and somewhat pointed pouch, which is reddish brown above, fading to light green below. Since the initial discovery some new varieties and forms of P. sukhakulii have been introduced, including variety ‘aureum’, which is pale cream to yellow in colour, and some albinistic forms with paler colours than normal. It is little wonder that P. sukhakulii became an instant hit both in its own right as a species and as a prospective parent. The first hybrid (with P. barbatum) was registered in 1970 as P. New Era. This was indeed a ‘new era’, being the forerunner of many successful crosses involving P. sukhakulii or its offspring. 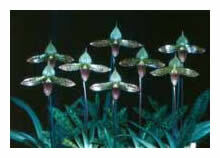 By 1997 there were 130 hybrids registered with P. sukhakulii as one of the parents. This number has since expanded to around 150 and, together with the many hybrids that have P. sukhakulii in their background, makes an impressive family tree. An interesting feature of the primary hybrids of P. sukhakulii (i.e. 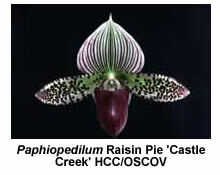 those produced by breeding with another paphiopedilum species) is that most produce attractive and/or interesting offspring. Some of the more notable crossings are P. Papa Rohl (with P. fairrieanum), P. Colorkuli (with P. concolor), P. Evelyn Rolke (with P. bellatulum), P. Nivarose (with P. niveum), P. Double Deception (with P. venustum) and P. Iantha Stage (with P. rothschildianum). In fact P. sukhakulii has now been crossed with most of the known species, one of the most recent registrations (with P. lowii) occurring in 2001. 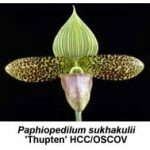 One can also expect some of the paphiopedilum species recently discovered in China and Vietnam to become partners of P. sukhakulii in the next few years. P . Iantha Stage is one of my favourite primary hybrids, as it displays the very best characteristics of each parent. The large flower size and bold striping on a yellow background of P. rothschildianum works perfectly with the broad petals and dominant spotting of P. sukhakulii. In addition, this impressive and wonderful hybrid is multi-flowering and a strong grower. P. sukhakulii has also been successfully bred with a number of existing hybrids. P. Makuli, (P. sukhakulii x P. Maudiae), registered in 1974, is a successful hybrid that still wins on the show bench. P. Sacred Dancer, P. Supersuk, P. Macabre and P. Masupi are other fine examples of this line of breeding that conserve the strong horizontal petals and eye-catching spotting of P. sukhakulii. In recent years we have also seen the success at major shows of hybrids with P. Raisin Pie (P. sukhakulii x P. Clarissa) in their breeding. Crossings of P. sukhakulii with complex hybrids, including exhibition types, are also popular. Some recent registrations include P. Murikuhi (with P. Murial Constance), P. Kingston Park (with P. Diana Broughton), P. Outer Limits (with P. Magic Mountain) and P. Brecho Vistasuk (with P. Vista Wish).